Cdc37 is a molecular chaperone required for the activity of numerous eukaryotic protein kinases. 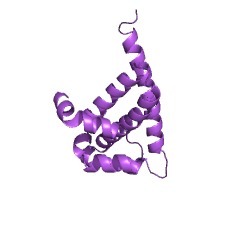 This domains corresponds to the Hsp90 chaperone (Heat shocked protein 90) binding domain of Cdc37 (PUBMED:16098195). 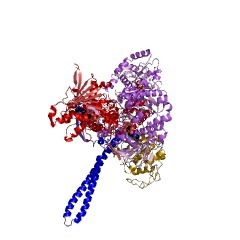 It is found between the N terminal Cdc37 domain which is predominantly involved in kinase binding, and the C terminal domain of Cdc37 whose function is unclear. Cdc37 is a molecular chaperone required for the activity of numerous eukaryotic protein kinases. This entry corresponds to the Hsp90 chaperone (heat shock protein 90) binding domain of Cdc37 [(PUBMED:16098195)]. It is found between the N-terminal Cdc37 domain (IPR013855), which is predominantly involved in kinase binding, and the C-terminal domain of Cdc37 (IPR013873) whose function is unclear. There are 1781 CDC37_M domains in 1779 proteins in SMART's nrdb database. Taxonomic distribution of proteins containing CDC37_M domain. This tree includes only several representative species. The complete taxonomic breakdown of all proteins with CDC37_M domain is also avaliable. Click on the protein counts, or double click on taxonomic names to display all proteins containing CDC37_M domain in the selected taxonomic class. Cdc37 maintains cellular viability in Schizosaccharomyces pombeindependently of interactions with heat-shock protein 90. Cdc37 is a molecular chaperone that interacts with a range of clients andco-chaperones, forming various high molecular mass complexes. Cdc37sequence homology among species is low. High homology between yeast andmetazoan proteins is restricted to the extreme N-terminal region, which isknown to bind clients that are predominantly protein kinases. We show thatdespite the low homology, both Saccharomyces cerevisiae and human Cdc37are able to substitute for the Schizosaccharomyces pombe protein in astrain deleted for the endogenous cdc37 gene. Expression of a constructconsisting of only the N-terminal domain of S. pombe Cdc37, lacking thepostulated heat-shock protein (Hsp) 90-binding and homodimerizationdomains, can also sustain cellular viability, indicating that Cdc37dimerization and interactions with the cochaperone Hsp90 may not beessential for Cdc37 function in S. pombe. Biochemical investigationsshowed that a small proportion of total cellular Cdc37 occurs in a highmolecular mass complex that also contains Hsp90. 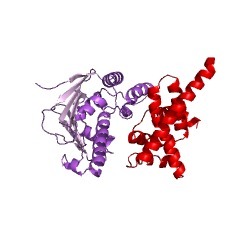 These data indicate thatthe N-terminal domain of Cdc37 carries out essential functionsindependently of the Hsp90-binding domain and dimerization of thechaperone itself. Cdc37 is a molecular chaperone with specific functions in signaltransduction. Cdc37 is required for cyclin-dependent kinase activation and isgenetically linked with the activity of several other kinases, includingoncogenic v-Src, casein kinase II, MPS-1 kinase, and sevenless.Strikingly, many pathways involving Cdc37 also involve the proteinchaperone Hsp90. The identification of Cdc37 as the 50-kD protein inseveral Hsp90-kinase complexes, together with other data, led to therecent suggestion that Cdc37 is a kinase-targeting "subunit" of Hsp90. 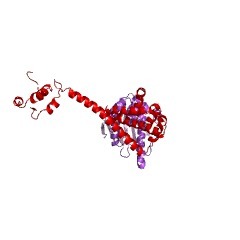 Wedirectly examined the effect of Cdc37 on Hsp90 functions. 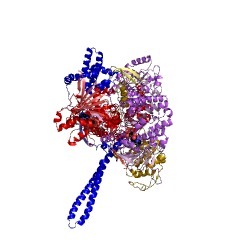 Rather thansimply acting as an accessory factor for Hsp90, Cdc37 is itself a proteinchaperone with properties remarkably similar to those of Hsp90. In vitro,Cdc37 maintains denatured beta-galactosidase in an activation-competentstate without reactivating it and stabilizes mature, but unstable, caseinkinase II. In vivo, Cdc37 overexpression can compensate for decreasedHsp90 function, but the proteins are not interchangeable. Cdc37 cancompensate for Hsp90 in maintaining the activity of v-Src kinase but doesnot maintain the activity of the glucocorticoid receptor. Thus, the verysimilar chaperone activities of the two proteins, uncovered through invitro analysis, diverge in vivo in specific signal transduction pathways.